Even More Ways To Save On Energy This Summer! In our last blog, we discussed why a properly functioning air conditioner can save you money on your summer energy bills, along with other small ways for making your home energy efficient. In today’s post, we’ll look into even more ideas and considerations for home energy efficiency to save you money and impart eco-friendly practices. There is no doubt that HVAC systems and home appliances use electricity, but with the right practices, you can turn any home from an energy-sucker to energy efficient. Discover even more ways to save energy in your Florida home this summer. Appliances are infamous for padding the energy bill each month, but there are ways to help reduce those costs. Did you know your washing machine is responsible for, at minimum, seven percent of your energy bill? Here are a couple of guidelines for an energy-efficient and budget-friendly washing machine. Use cold water when applicable. When it’s possible using cold water in the washing cycle reduces the energy usage because the water doesn’t have to be heated. If your clothing or other items are more heavily soiled, opt for warmer temperatures. Opt for shorter cycle times. Choose shorter cycle times because they use less water, and choose the lowest fill level as possible to avoid wasting more water than you really need. Soak your clothing. If you do have massively soiled clothing, try soaking it in a smaller container beforehand. This way you can scrub and run stained items with soap or stain removers before they actually go to the wash. This will avoid having to repeat a wash load because the stains didn’t come out. Invest in a drying rack. Get a drying rack to air dry some of your smaller items. Reserve the dryer for bulky bedding and towels. Use the auto-dry setting instead of a timed cycle. When you opt for the auto-dry setting, it senses when the clothes are dry and avoids using unnecessary energy. Don’t use your dryer as an ironing board. It’s easy and it often saves time when you can pop in linen pants for a to get out lines and wrinkles, but it uses a lot of energy. Instead, use a traditional ironing board. Dry related fabrics together. It may take a little more planning on your part, but if you can wash and dry similar fabrics together, you’ll be more likely to have a fixed dry time, which uses less energy. A refrigerator is a popular appliance that is one the most widely used household appliances, so learning how to reduce its energy consumption will help lower your monthly energy bill. Avoid refrigerator gazing. How often do you stand in front of the fridge and aimlessly gaze into the food abyss? Keep this gazing at a minimum and know ahead of time what you need from the fridge to avoid ceaselessly opening and closing an energy trap! Stock your refrigerator. 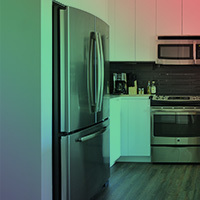 When the fridge and freezer are completely stocked, it uses less energy because less cooling escapes when it’s opened. Check the seals. Cool air can escape if the refrigerator seals aren’t secure, so always check to make sure the seals are nice and snug. Don’t rinse. Let your dishwasher do its job and don’t rinse the dishes before you put them in. Turn down the water temperature. Newer dishwashers have the function to heat already hot water from your water heater, avoid these functions. You can even take it one step further by turning down the thermostat on your hot water heater. Separate large appliances. Try and keep the dishwasher and refrigerator separate. When they’re close by, the dishwasher heats the refrigerator causing it to work overtime. 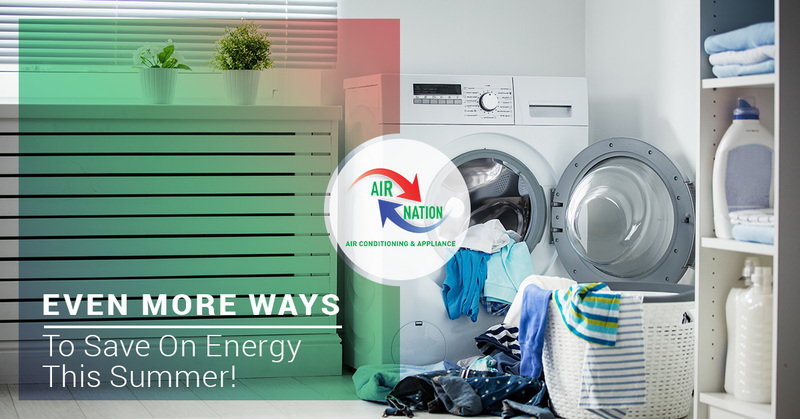 Save even more energy this summer by making a few small changes to your household appliances, and always, get your HVAC systems and appliances serviced at least once per year! For the best HVAC services and appliance repair, call us today!